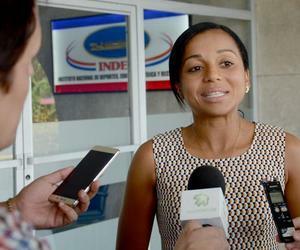 Ecuador’s Sports Minister Pamela Morcillo Ortiz said on Thursday in Havana that “we are learning on Cuba’s experience”, while speaking to Cuban journalists. The young leader, former basketball player and graduate from the International Physical Education and Sports School (EIEFD) expressed satisfaction for visiting Cuba once again and is grateful for studying on the island. I am grateful to the Cuban people for allowing me to grow and learn the path of my sports life and showing me how to best serve my country and Cuba, expressed the Ecuadoran official visibly moved by her words. Referring to her visit, she commented that “we are working on signing an agreement that will allow us to continue strengthening the solidarity ties between the Ecuadoran and Cuban peoples. We are discussing issues that we want reflected in the agreements”. Asked about the conditions and objectives of the South American nation in the current Olympic cycle, Morcillo said that there is a High Performance Project in the country since 2013 around implementations of Cuban policies and experiences with good results. She explained that there are currently 243 athletes preparing for Tokyo 2020 in which the State guarantees participation in national and international events, clothing, equipment and scholarships. We have outstanding athletes between the ages of 18 and 22 and that is why we think in possible classification to Tokyo 2020, we also dream of a medal, but we are respectful because the sports process does not have results from one night to the other, said the 35 year old Sports Minister. Regarding the advances of sports during the decade of the Citizen’s Revolution headed by President Rafael Correa, she stressed that “there has been a lot of advances, huge steps forward”. The Sports Minister highlighted the creation of the Ecuadoran Paralympic Committee and five training centers for high performance with modern infrastructure, allowing athletes to concentrate in world events. Sports began important within government planning, given it the priority and place it deserves as well as economic resources, she said.